I notice I haven’t put anything in about August in my garden. Well, it rained! 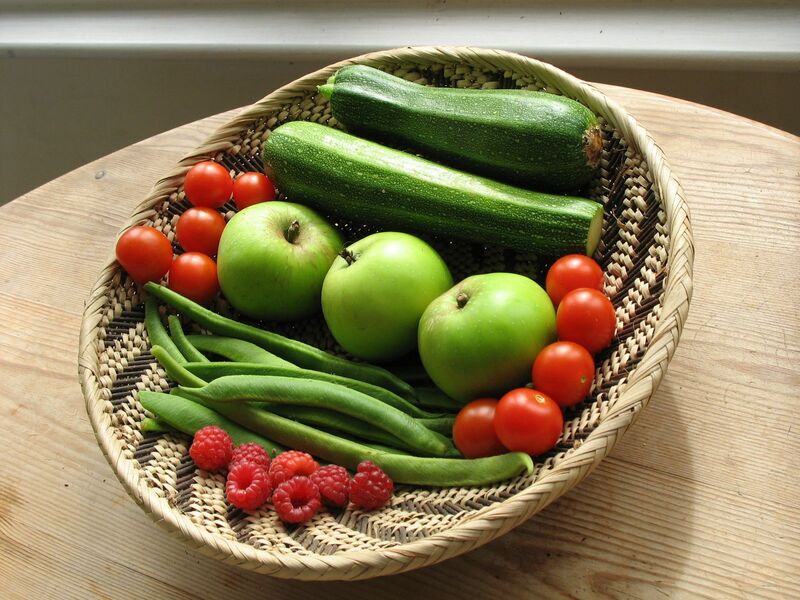 I harvested many, many courgettes (Black Beauty Dark Fog from Chiltern Seeds) and quite a few French beans, (I always grow climbing ones ‘Mr Fearns’ and save the seed year on year) and a lot of greenhouse cherry tomatoes. I also tried some Oregon Snow Peas, but they were stringy – I much prefer ‘Weggiser’ mangetout from the Organic Gardening Catalogue. I may try sugar snap peas next year as the veg boxes’ peas were very nice. I grew some Chiltern Seeds’ ‘Little Gem’ lettuce fairly successfully. ‘Pandora’ by Thompson and Morgan is also good, but best is ‘Paris Island’ from the Organic Gardening Catalogue. All are little Cos lettuces – crisp and more manageable than the big Cos. The early raspberries were minute in July because of lack of rain, however the autumn raspberries started early, so now I have the pleasureable task of picking fresh large juicy raspberries every morning to put on my cereal. And I am now picking runner beans – ‘Lady Di’, ‘Painted Lady’ and ‘Red Flame’. There is some Swiss Chard growing well. I have decided to stop trying to grow brassicas, after a disastrous summer last year fending off Cabbage White butterflies followed by a small snowbound crop of Tuscan black kale. I do like the kale, so amnesia will probably set in next year.. I am growing a lovely yellow ‘summer squash’ with a great lumpy shape – it’s really a courgette in flavour though. It’s from Thompson and Morgan and is part of their ‘Patty Pans mixed’ – I had the pale green one out of the packet last year, not so interesting! Failures: I couldn’t germinate parsley or sage this year. What a shame! Have previously grown Thompson and Morgan’s ‘Big Mountain’ parsley well, so will use that next time – the flat leaved sort doesn’t seem to like me. Sage should be very easy, so I will buy new seed next year. It must go off quickly. My own tomatoes took months to germinate and are still not cropping. I bought 4 Gardener’s Delight plants for £1 in May: these have done very well and are delicious. Not sure what happened to the batavia lettuce, either. The squashes ‘Uchiki-Kuri’ and ‘Butternut’ germinated well but died after planting out (probably the rain and also I didn’t give them enough sun.) Uchiki Kuri has grown well for me in the past and is lovely – deep orange flesh, sweet. No plums this year, don’t know why as there were none last year either (the Victoria plum tree I have usually has some every 2 years at least). It looks happy, has been pruned – may be recovering. The apricot tree was fantastically fruitful. It’s an espalier growing against my house wall called ‘Flavourcot’. It looks beautiful too – the fruits are splashed with red and taste very good. Lots of Bramley apples to come, and then best of all – the Coxes. And except for some Oriental Saladini in the greenhouse, that’s my lot of food growing for the year! Garlic planting to follow after the bonfire in October.